Basically, we use news, press-releases, and papers published earlier at isicad.net. However few actors of the Russian market produce English publications about their local activity in Russia. In important cases, we try to retell their Russian news just in our own words. Since autumn of 2009, we’ve got a great support from bloggers and journalists write in English and visit(ed) Russia: this started from a remarkable series of Ralph Grabowski and then was continued by Deelip Menezes, Oleg Shilovitsky, and hopefully, Martyn Day. See some references below. - everybody publishes news about new contracts and organizes big conferences and seminars everywhere in Russia. - Siemens PLM promotes its ST3 and continues working with big industries. - Top Systems announced that they have a full-scale world-class PLM. APPIUS is a small but noticeable company for quite a long time effectively working at PDM systems. In particular APPIUS released a PDM-component to integrate it with the most popular Russian CAD KOMPAS-3D from ASCON. The most interesting point is probably that APPIUS is closely and persistently working with 1C Company. 1C is likely the biggest Russian IT company whose accounting software products are installed in practically all Russian offices. The English web page of 1C (very old-fashioned and rudimentary) says: "Founded in 1991, 1C Company specializes in development, distribution, publishing and support of mass-market software. At present, 8000 dealers from 600 cities cooperate with 1C. About 3200 teams constitute the 1C:Franchising partner network,which is a main channel of value-adding for 1C products". - KOMPAS-3D V12 now released! - ASCON and Cloud IT open SaaS model to CAD market. Autodesk is successful in the Russian market, the company has very many customers and is leading in application of methods of social networking and communication. Sometimes one can hear opinions and complaints that customers in Russia are still not enough involved into Internet-based networking. This is true and not true. First, all young and mostly middle-aged people are sufficiently involved in networking of various genres: even when they are communicating from homes they are active in discussion on their professional topics. This is true also for those who work in comparatively old-fashioned and conservative industries. Second, there are small and medium (private) enterprises that use or are ready to use up-to-date communication technologies. So perhaps leadership of Autodesk in communication technologies can partially be explained by specifics of their typical customers: young and working in not old industries. However this does not in any way detract from the organizational efforts and achievements of the company. A good example is Autodesk Forum "Design Technologies" which was held in Moscow on 22 and 23 September and attracted 1200+ participants. Maybe the simplest characteristics of the event is that was looking quite like Autodesk University so the rumours about AU-2011 in Moscow are not surprising. In June, isicad in "Autodesk Forum-2010 in Moscow: How Many New Gimmicks?" interviewed Anastasia Morozova, the key organizer of the event, and today we can confirm that everything was fulfilled or over fulfilled. One can catch some impression from Deelip Menezes’ "Autodesk Forum In Moscow", an isicad reportage and of course from abundant official Autodesk publications. During the reported period, isicad published interviews with high-rank Autodesk managers Matrin Steuer ("The Role of Sustainable Design in Manufacturing") and Miikka Arala ("About AutoCAD for Mac, Linux, clouds and competitors"). The mere fact that this company from Saint-Petersburg is an exclusive Russian distributor of SpaceClaim is interesting. It also announced distribution of solutions from ITI TranscenData and Simerics as well such products as CFturbo, Flowmaster, Cadmatic, and seem to aggressively looking for more business partnerships. DS Russia is successfully working with big industrial customers, actively (much more than Siemens and PTC) demonstrates its commitment to social networking, and insists that they do not care about deficient distribution of SolidWorks in Russia and CIS. Yesterday (28 Oct) by the event in Moscow, SolidWorks Russia started their series of conferences, next weeks there will be several more conferences in other big Russian cities. The Moscow conference presented an impressive set of industrial examples that look very successful. However I believe that the Russian customers receive maybe 10 times less marketing messages from SolidWorks than from its competitors. "Road to CATIA V6 and SolidWorks sales through Facebook — Interview with Thierry Collet, Vice President, Global Marketing & Education Dassault Systemes". In mid October DS held its 6th Russia/CIS PLM Forum. Our report "Engineers of the world, unite in PLM 2.0!" is in Russian but I recommend to peep into since it contains 60+ pictures and gives a useful impression. At the cover page of isicad.net #23 you can see a picture of the first Russian-made sport-car from "MARUSSIA MOTORS" presented at the PLM Forum of DS, its design was based on CATIA and SolidWorks. (MARUSSIA is not only MA-RUSSIA but also a traditional and nice variant of a woman’s name Maria, e.g. Sharapova). See "MARUSSIA MOTORS HAS TAKEN PART IN THE LARGEST FORUM OF PLM-SYSTEMS". - TopSystems: "Russian PLM-system T-FLEX 2010: Technologies, Solutions, Vision". - "Synchronous Technology: The Third Attempt" (Dmitry Ushakov reviews ST and compares it with the approach of LEDAS). - LEDAS Releases LGS 3D v4 Constraint Solver for Assembly Design and Direct Modeling. "Our objective is to offer CAD users licensed products at the lowest possible price. We are authorized distributors of Altium Designer (P-CAD), Graphisoft (ArchiCAD), and CSoft Development. In September – November, we are holding our seminars in 9 big Russian cities". See also Nanosoft Visit by Deelip Menezes. PTC in Russia is in my opinion characterized by very active business partners including Pro/Technologies and IRISOFT. Every several weeks they announce about new contracts with comparatively big industries or about their own software integrated into PTC products. Interesting to mention that within a contract with a big Ukrainian industry, Pro/Technologies and ASCON integrated Windchill MPMLink from PTC and VERTICAL from ASCON. This year, Russian office of PTC is definitely and constantly increasing its marketing activity which can be seen by a lot of seminars and adv in media – including isicad.ru. - "Khrunichev State Research and Production Space Center and Siemens PLM Software Announce One of Russia's Largest PLM Implementations"
- Irkut Corporation Selects Siemens PLM Software Solutions to Launch New MC-21 Airliner . Top Systems is a vendor of a powerful parametric CAD but from recently the company insistently promotes its PLM complex. See also 3D Graphics Performance Comparison – Part 12 (T-FLEX) of Deelip Menezes. In September, Deelip visited Top Systems and promised to publish his special review (as also about LEDAS:)). 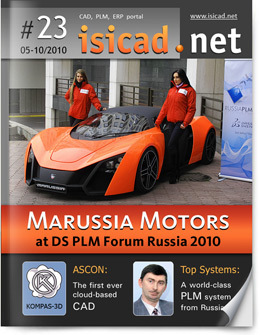 isicad activity is first of all reflected by its publications at isicad.ru , isicad.net , and PLMpedia.ru. This September (21st) we held the 4th isicad multi-vendor Forum whose key point was our cooperation with Cyon Research which resulted in organizing a Seminar COFES-Russia. About 100 representatives from practically all active actors of the Russian CAD/PLM market took part in the Forum/Seminar. 12 short presentations and discussions in 7 round tables were quite interesting and lively. Discussions around social networking and new business models were especially active and exciting. Audience was very much impressed by the talk made by Brad Holtz, President of COFES and Cyon Research (Brad Holtz address to the readers of isicad.ru/isicad.net) . Other foreign guests, including Deelip Menezes, Oleg Shilovitsky, Martyn Day, experts and managers from Autodesk, Dassault Systemes, Exalead, and SpaceClaim made a very important contribution to the event agenda. The answers given by the attendees to the COFES-isicad questionnaire show that everybody wish to attend the next such event, liked a COFES-like organizational structure of the isicad-COFES event, and propose to enlarge its discussion sections. The article "What could be seen and heard at COFES-Russia / isicad-2010" and the English version of the event web site hopefully give a good impression about the event including the access to videos/audios (presentations can be received by request). During the visit of Martyn Day, we agreed upon a certain cooperation between DEVELOP3D and isicad.ru.